Cleveland - It was a brokered convention with three candidates and two factions. Republican Party leaders hoped for unity, but once the delegates began voting, consensus proved elusive. Welcome to the presidential nominating convention of 1880. After round upon round of votes, the delegates finally nominated a dark horse from Ohio on the 36th ballot. The candidate nobody saw coming was James A. Garfield, a congressman and Civil War veteran. He went on to win the presidential election. Garfield was shot by an assassin four months after taking office, and without a legacy, his story has faded. But history geeks and maybe even some of the Republicans heading to the convention in Cleveland this summer may find Garfield’s story — and the jockeying that led to his nomination — of interest. The Republican Party was founded in the 19th century to stop the expansion of slavery, and Garfield, who served in the Union Army, went to Congress to advocate for the rights of African-Americans. Arrington says he views Garfield’s commitment to civil rights as “the last stand of the roots of the Republican Party” from that era. For conventioneers, political history geeks and others, there’s an added bonus: Garfield is the only U.S. president whose birthplace, home and final resting place can be visited in one day. Here’s a look at those sites. Garfield was the last president born in a log cabin. His father died when he was an infant, and his mother raised him and three siblings on a frontier farm in dire poverty. “They were so poor, they didn’t even have candles,” said Sandra Vodanoff, who volunteers at a replica of the cabin about a half-hour’s drive from Cleveland. The cabin site at 4350 S.O.M. Center Road in Moreland Hills, Ohio, also includes a historical marker and a statue of Garfield that depicts him as a shoeless boy carrying a hoe and a book. Open Saturdays, June through September, 10 a.m.-1 p.m., or by appointment, at 440-248-1188. 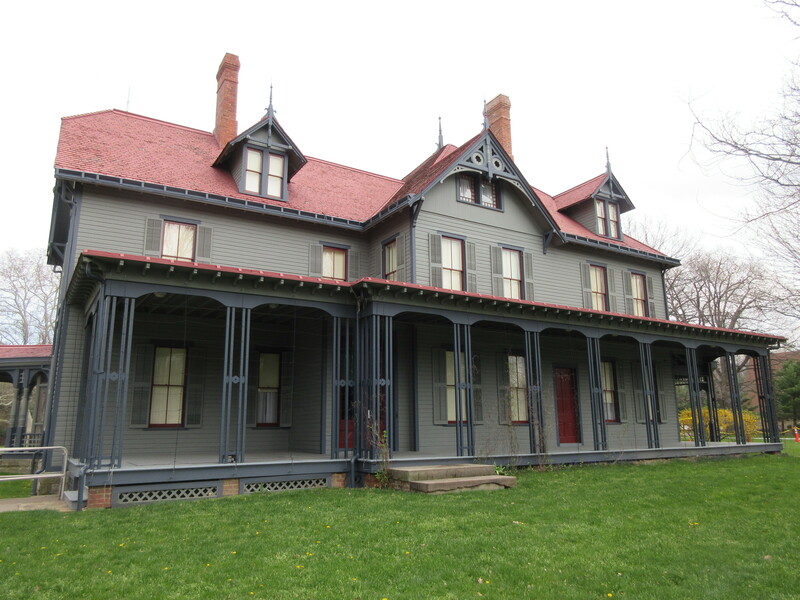 Garfield, his wife and five children lived in a farmhouse on nearly 160 acres in Mentor, Ohio. The property was nicknamed Lawnfield by reporters covering the 1880 campaign, and today it’s a National Park Service site. The interior has been restored to Victorian splendor, including the wild wallpaper patterns and heavy, dark furniture popular in that era. Looking out from the front porch, you can almost imagine Garfield standing there greeting the thousands of people who turned out to meet him during his campaign. The house includes the first-ever presidential library, created by Garfield’s widow as a private memorial. Open 10 a.m.-5 p.m. daily May 1-Oct. 31; Friday-Sunday, 10 a.m.-5 p.m. Nov. 1-Apr. 30. House tours, $7. Museum, grounds and film free, https://www.nps.gov/jaga/ . This elaborate castle-like monument with turrets and arches is located on a hill in Lake View Cemetery in Cleveland. Inside, a towering white marble statue of Garfield is spotlit amid mosaics, stained glass windows and granite columns. Downstairs, Garfield’s casket — the only presidential casket on full display — is covered with an American flag next to his wife’s casket. From an outdoor balcony on a clear day, you can see 40 miles of the Lake Erie shore and the Cleveland skyline. Open April 1-Nov. 19, 9 a.m.-4 p.m., free, http://www.lakeviewcemetery.com/garfield.php .